Gravity's Revenge is a high fantasy hostage thriller. pretty original! the plot was a unique experience for me. kudos to the author for putting together a fantasy with an exceedingly well-developed magic system, appealing characters, a unique setting, a lot of twists & turns, and a highly intriguing threat. and a hostage situation! I just cannot emphasize enough how pleasantly surprised I was to realize that this was what the novel was essentially about.like a lot of active reviewers, I get a lot of review requests - most of which I sadly turn down or even more sadly ignore. many of these review requests are for self-published or indie novels. I have a 'do no harm' rule for self-published or indie authors which dovetails nicely with my 'don't look a gift horse in the mouth' rule. the end result is that I don't put out 1 or 2 star reviews for review requests because that just seems ungrateful and sorta assholish (not that I judge others for doing what I choose not to do; it's my own thing). the end result is that often no review appears. happily, I never considered that for this book. I felt pretty confident about what I was reading within a couple chapters.not that it doesn't need a lot of work. I think a stern and unforgiving editor could do wonders for this novel. the writing is hit or miss and the dialogue in particular needs so much work - a real case of trying too hard there.but man the originality and the breadth of imagination on display almost (but not quite) cancels all of that out. a narcoleptic sorceress who crafts her spells while sleeping! that was awesome. an order of religious fanatics called Bright Palms who glow with a healing light and who have been drained of all emotion. that was also awesome. a magical academy where gravity does not apply and so we have floating pools & lakes and a 'skyway' and a lot of fights & chases up walls & on the underside of bridges & all over the place. that concept is so awesome that it is begging to be visualized in anime format. and a high fantasy hostage situation! so awesome. I have been a Marling fan since I first got my hands on the excellent Brood of Bones, the first book set in the Lands of Loam, and look forward with eager anticipation to each new release—and he is a remarkably prolific, chalking up four books in the space of two years. Lucky for us, he keeps getting better and better.Gravity's Revenge is easily the most intense of Enchantress Hiresha’s three books. What begins as the innocuous introduction of a student to the Academy swiftly turns into white-knuckle reading. Hiresha is thrown into an untenable situation when the Bright Palms choose to hold her beloved Academy hostage—and their actions threaten to rip her entire world apart. The Bright Palms are a truly terrifying enemy. They are devoid of emotion and unaffected by physical duress. The leader in this foray, Sheamab, is frighteningly relentless, and learning more about Bright Palm magic was a treat. They're every bit as awful as Feasters.Lord Tethiel is one of the most compelling supporting characters I’ve ever seen. A victim of tragedy and betrayal (though we’re only given hints about his past), he struggles with the burden of the power he holds. He can be at once charming and dreadful, and his relationship with Hiresha is never clear-cut. Is it a case of impossible romance, or is he masterfully manipulative? His slithery ambiguity keeps me guessing.Hiresha herself remains a wonderful anti-hero. The tension and sheer speed of events seems to help her stay awake, but the constant fatigue brought on by her condition is another enemy she battles. While she is fiercely determined to save the Academy and its residents, things don’t always go the way she plans, and sometimes she makes mistakes. Those set-backs heighten the tension and increase the sense of jeopardy. I love the way her mindset—as seen from the beginning of her story in Brood of Bones—is inevitably altered by her experiences, and she has some doozies. It makes me wonder if all the other enchantresses at the Academy really lead the sedate, proper lives we’re led to believe.In the midst of the intense action and drama, Marling finds time to paint vivid pictures of the truly unique setting that is the Mindvault Academy. Twisting towers, rotating buildings, tentacled structures, and gravity-defying walls and bridges… all in the middle of a blizzard, no less. Gravity’s Revenge is a rich tapestry of the senses sure to amaze and delight. If you haven’t yet paid a visit to the Lands of Loam, it’s just a short flight away, and the journey is well worth your time. Gravity's Revenge is the third book of the Enchantress series, and continues the development of Elder Enchantress Hiresha, Tethiel the Lord of the Feast, and others.This book is by far the most straightforward of the three, following a basic fantasy quest/action storyline.The story opens with Hiresha escorting the daughter of her maid, Janny, up the magical Skyway to the Academy of enchantresses. On their way we are treated to both explanations and demonstrations of the Academy's gravity-defying design. Hiresha also witnesses its failure as she sees the form of a young enchantress hurtle past to her death.Just getting the other Elder Enchantresses to acknowledge the possibility of a failure of the college's enchantments is Hiresha's first problem. The Academy's design is attributed to the Opal Mind - the Goddess of Intellect and Creativity. Despite the fact that they know how the magic works, suggesting the possibility of its failure is tantamount to heresy.Before anything can be done about the possibly failing magic, another wrinkle is added to the tapestry - Bright Palms have ascended the cliffs and intend to take the Academy hostage in order to force concessions from the government. In short order, Hiresha is cut off from her stash of gems, her Spellsword bodyguard, and most of the rest of the academy.The Final Step to IndependenceBecause Hiresha is so thoroughly cut off from her normal sources of support, she is at her most active and independent. This completes a character arc that began in Brood of Bones where she is almost entirely dependent on her maid and spellsword to accomplish anything. In the middle book, she has cast off many of the comfortable and confining trappings of pomp and title, but still leans heavily on her maid and spellsword. In Gravity's Revenge she is forced to rely on herself to overcome both physical and mental obstacles. Glad to find out that this is not the last of the Enchantress series. I first checked Amazon before DREAM STORM SEA was posted, so when I finished this book, I was left mixed feelings about the ever-wavering state of the Fos-Hiresha-Tethiel triad. Tethiel's dark nature makes for an uneasy companionship, but the continued mistrust of others (even in the face of his moments of heroism) has me rooting more for him than for Hiresha and Fos at times. It'll be interesting to see whose instincts are true as the story progresses further.I understand that a certain disconnection to her feelings/intuition is a facet of Hiresha's personality. However, the disconnect occasionally became distracting to me, similar to those moments when a movie hero gets repeatedly punched in the head yet shows little immediate reaction to the blow. But I've become sensitive to the reality that's often not inherent in stories meant to entertain-- that person who sits in the audience after a battle of heroes and villains and wonders, "Who's going to pay for all of those repairs?" Gravity's Revenge is the fourth of A.E. Marling's books set in the Lands of Loam, and the third starring the Enchantress Hiresha. In this novel, Hiresha is forced to protect her university, a bizarrely fascinating place of magical instruction, from the invasion of Bright Palms, strictly-regimented and unfeeling people, who hold the university and its students and teachers hostage. Beloved characters, such as Maid Janny and Lord Tethiel make reappearances, even better than before.I had high hopes for this book, having read and loved Marling's other works, but Gravity's Revenge exceeded them in ways I'm still struggling to process. The plot is fast-paced and intense, and Marling's distinctive, quirky writing style and word choice get even better. His fantasy world and characters are uniquely his own, very different from much of fantasy literature, but at the same time, they are lovable and intensely relatable. The novel comes with beautiful illustrations at the beginnings of chapters, bringing Marling's descriptions to life on the page.Beautifully done, Mr. Marling. Do you like non-stop action? Dizzying landscapes and uncertain stakes? Feeling terrified and exhausted and exulted along with the main characters? Watching as beautiful things are destroyed for the sake of preserving that which is even more beautiful?I loved this. I had a hard time putting it down, but I often had to, it was so stressful. Hiresha proves yet again that she can force her way through her sleepiness in times of peril. (view spoiler)[Though I was surprised she didn't conk out immediately after Sheamab smashed into the ground and the danger passed. (hide spoiler)] The turmoil I felt while reading this was raw and real and I think that Marling has accomplished an amazing thing to evoke these emotions in his readers. Also, the copy I borrowed from the library (all the way from Utica, NY!) was full of glitter. It was delightful if not slightly confounding. I maaaay have shook out some on top of my head because I was really excited. I am hoping the glitter was there deliberately because it is a Lady of Gems book. A taut narrative, skillfully wrought, with a continuing focus on engaging characters and a fantastical setting that is like a new character all unto itself. The internal illustrations did a great service to this setting, the magical Mindvault Academy, and served as a wonderful spark in imagining the gravity-defying world in which the tale unfolds. Marling uses his laws of magic (and gravity) consistently and creatively, and the best part of this is that it holds true for his protagonists and antagonists alike. No one is easily duped, and victory comes hard and sometimes at great price. Keeping the stakes honest keeps the tension ratcheted up and makes this a tough one to put down. The artwork is stunning, and adds to book tremendously. The structures in the mindvault academy are so strange that it really helps to see them laid out visually.This book isn’t as dark as Brood of Bones, nor is it as light-hearted as Fox’s Bride. Unlike the first two HIresha books, this one plays out more like an adventure novel.The book starts out with Hiresha returning to the MIndvault Academy, in order to initiate Janny’s daughter, Minna, in as a novice. Returning with her are Maid Janny and Fos Chandur.The beginning third of the book is a little slow, as Hiresha goes about her duties as Provost. This section is improved greatly when The Lord of the Feast, Lord Tethiel. Lod Tethiel is by far my favorite character in these novels. He is in rare form for his first appearance, and Marling describes his illusions in stunning detail. The scene between Hiresha and Tethiel dancing in the ballroom is absolutely amazing.Things pick up considerable in part 2 with the arrival of The Bright Palms. Now, the author, A.E. Marling, claims that the Hiresha books aren’t a series, but I disagree. I think the conflict between the Bright Palms and the Academy would be hard to follow if you aren’t already familiar with this Universe.For the remainder of the book Hiresha uses her wiles, her knowledge of the Academy, and her magic to fight off the Bright Palm invaders. Along the way she gets help from Fos Chandur, Lord Tethiel, and her pet Fox. AS a contributor to A.E. 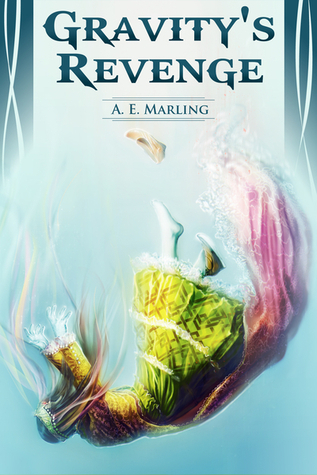 Marling's Kickstarter I was fortunate enough to get a read-ahead copy of Graity's Revenge. Wow. I could not put this down. Really - I kept sneaking reads while at work, and stayed up too late at night reading it. This is without a doubt the best book he's written.Gravity's Revenge is the third book about the Enchantress Hiresha. This takes place a couple of years after his last book, The Fox's Bride. Hiresha is teaching at the MIndvault Academy, and is highly respected by her peers.All this begins to fall apart when Lord Tethiel shows up (yes!). And the enchantments around the Mindvault Academy are failing. If this wasn't enough, the Academy is invaded by Bright Hands....Unlike his prior books, Gravity's Revenge is non stop action. There were cliffhangers, death defying stunts, and plenty of twists and turns. Hiresha has truly met her match with the leader of the Bright Hands. Likewise, the magic is amazing! You would think simple spells of lightening, attraction, and weighting wouldn't be enough to change the world, but Hiresha and the Mindvault Academy proves this wrong. Just like Opal Mind's pyramid, the magic is amazing. Buy this. Read this. There is no way you can be disappointed. I really like this series. I still love the magic of this bedazzled world, the sleeping magic, and the main character. I love her coolness, sarcasm, sense of humor, calculating methods, and loyalty.I read this with text-to-speech narration, and I'm noticing that it doesn't jive with this type of author. His writing can be understated (you have to read between the lines sometimes), and I feel like I'm trying to bail water with a laundry basket--not quite catching everything. This book was all action and had very little scenes that provided time to reconnoiter and think about what's going on. Very go, go, go. Some books have a character thrown in (often young and inexperienced) to sum up to the reader what's going on, but it's just a natural part of the story-line, like a kid who'll ask, "Why is he chasing us?!" and give the main character a chance to explain what's going on to the reader because it has to be explained to the kid. I'm missing those kinds of internal summaries that keep motives clear. Although unclear motives may be a purposeful part of the magical & mysterious intrigue that permeates this series. The innovative imagination of A.E. Marling continues in the adventures of the bejeweled Hiresha, this time more intertwined with the trickster Lord of the Feast, Tethiel. Marling's imagined universe is rich not only in culture but in innovation, the world filled to the brim with complexities of human interaction on every level.The pace from the invasion on is breakneck (a little pun there, considering the subject).Even if a reader hasn't joined adventures one or two, this one stands alone very well. For those familiar with the series, many wonders await within the walls of the academy, and familiar characters are joined by fascinating new ones as the order of Hiresha's world is turned upside-down.I look forward, as always, to Marling's next writing venture, whatever that might be. When I started reading this I didn't realize it is the 3rd book in the series. However, I think the author did a good job explaining thing so I didn't feel lost. There were clearly references to earlier books, but I'm not sure to what extent there were spoilers. And the characters are not easy to love. Each has flaws, and the heroine has to deal with many who turn out to be different than she thought. And those she should be able to depend on are less than supportive. Yet, she is true to her own commitments and manages to fight on through increasingly bizarre and horrifying situations.The magical environment of the academy is pretty fantastical. It would be a great one to see on the big screen, although it light be disorienting--like living in a world designed by Escher. Now I am even more interested in going back and reading the first book, which I already own. I have enjoyed all her books but this one not quite so much. She took a risk and moved her characters into a surreal context. Some great characters from past books are omitted entirely, and at times I found the dream/reality inversion as confusing as our heroine. The strong narrative of the earlier books is diluted by the "sliding doors" phenomena, and the drama seemed more contrived in a sense. I wondered if it was a parable about human treatment of animals. And that almost preachiness diluted the narrative because it felt more contrived than a real battle between complex characters, as the earlier books had been.Nevertheless, I recommend it as Marling at her worst is better than many other writers at their best. Hiresha's fight against the Bright Palms as she strives to save her academy, her home, swooping through windows, running upside down on bridges, spraying jewels every which way was undoubtedly one of the coolest things I have ever read. Marling's vivid, poetic, and enchantingly descriptive text exudes a captivating backdrop for an equally captivating story and cast of characters. By far, so far, the best installment of the Lands of Loam series! I am hopeful that Dream Storm Sea is not the sole remaining story left from this wondrous land! A wonderful third trip into Hiresha's corner of the Lands of Loam. I greatly enjoyed the previous two books and this new addition didn't disappoint. Hiresha has come a long way since Brood of Bones and in Gravity's Revenge she really gets a chance to work more on her own and show how much she has grown. It's a more action oriented book than the last two but we still get a satisfying dose of our favorite characters and a deeper peek into Tethiel. I'm already looking forward to the next book and I hope to find out more about Minna and Alaya. Absolutely wonderful, such a joy to read. Insanely creative, intensely clever, and just plain beautiful. I'm waiting to find out A.E. Marling is a nom de plume for an already famous author wanting to break away from others expectations, though in truth no one writes like him. Adore his writing! Gravity's Revenge is a relentless read, putting familiar characters through the wringer, pitting a brilliant mind, a strong body, and a lord of illusions against a relentless foe. It's an incredible ride! I'm amazed by this book.Not only are the ideas and characters new, real, and full of pathos, but the writing style is so unique and beautifully imagined! The story on a paragraph level was wonderfully entertaining, I enjoyed the prose so much. Then the book on a holistic level was brilliant...I loved the story and characters!I'd call this literary fantasy, but with a fast enough pace to keep anyone's attention! Highly recommended. By far the best yet in this collection of books.. So glad I discovered this author..
A.E. Marling - A.E. Marling wrote his first fantasy novella after his freshman year in high school. In college, he found nothing gave him a greater urge to write than science lectures, and he sat through a lot of ‘em. He has yet to repent his fascination with fantasy and is intrigued by its grip on the human imagination.Both ambidextrous and word-voracious, his diet ranges from Arthurian legends to Jane Austen. He denies being a running addict, though he has to shout it over the noise of the treadmill. His best writing ideas pounce on him when he would rather be sleeping, thanks to insomnia.His current lair is in the bellybutton of California, and his thoughts touch ground there between flights.